This post was originally published in 2012 and has been updated to reflect new features. In our increasingly connected, internet-oriented society, no “online collaborative software” is complete without a full range of commenting features or integrations. At Lucidchart, we understand, which is why we have gone to great lengths to ensure that our software makes collaboration easy no matter where you choose to work. 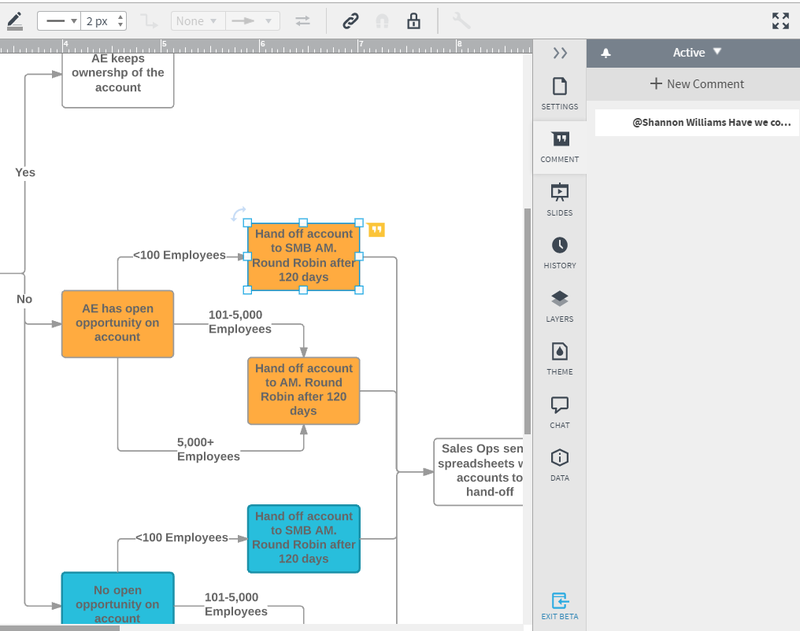 Lucidchart was the first diagramming application to offer team commenting capabilities and the first SaaS application to integrate with Confluence Cloud. Since 2012, when these features were released, they have become Lucidchart classics and favorites among our users. Let’s take a closer look. Not a Confluence user? Check out our integrations with Google Apps, HipChat, JIRA, and Jive! Commenting and Lucidchart chat make it possible to collaborate with your team even if you work on the other side of the globe. Both of these features are anchored in the Dock on the right-hand side of the editor. Commenting allows you to attach questions, concerns, or assigned tasks to specific shapes on your document. You can even tag a colleague using @name mentions. Adding a comment is simple—you can do so in one of two ways. Reply to comments in an easy-to-follow thread format. Lucidchart chat lets you talk with your colleagues in real time as you edit a document together. In the Dock, select “Chat,” and then type a message or click “Start a Hangout” to talk face-to-face. One of our most popular integrations, Confluence Cloud allows Atlassian fans to import their diagrams directly into team wikis and other collaborative documents. You can even jump straight from Confluence into the Lucidchart editor to make changes to your diagrams. Sign up for Confluence Cloud. Upgrade to a Lucidchart Team account. Enable and configure the plugin in Confluence (see instructions). Start creating and sharing Lucidchart diagrams in Confluence. Already a Gliffy user? Never fear. 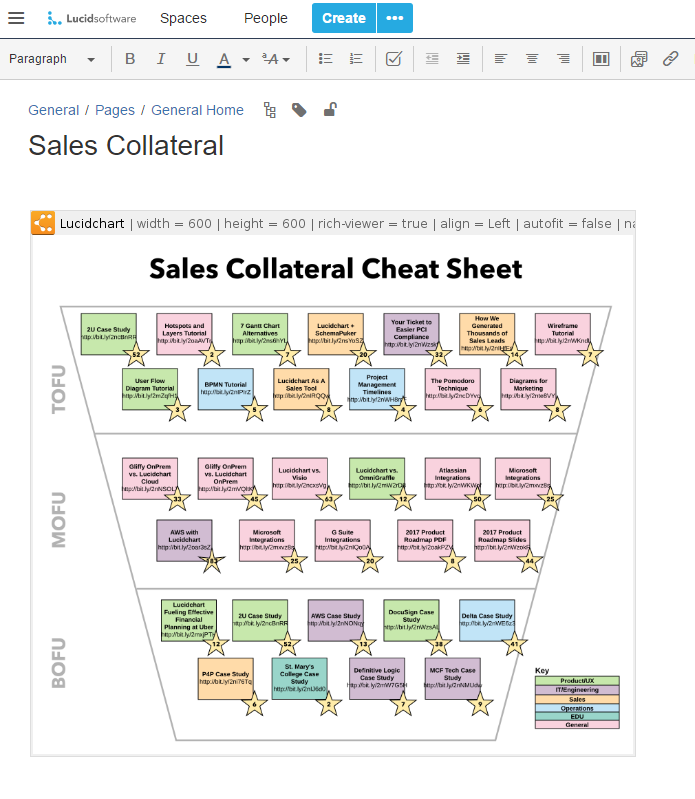 You can still take advantage of Lucidchart’s collaborative features without having to recreate your diagrams. Try Gliffy mass import for Confluence Cloud. We hope you take advantage of these powerful features. Our goal is to make diagramming easy and collaboration even easier. If you have any questions or concerns, please leave them in the comments below or contact our Support Team.